Wildfires: RANGE magazine's history of inspired reporting and solutions | RANGEfire! Something can and should be done, immediately. Waiting is dangerous. When President Trump visited the devastation in California, he said the cause of the wildfires was poor forest management. Today, after the destruction in California, Bosworth’s assessment of the situation has become even more ominous. The destructive fires can be directly linked to the failed policies of the federal agencies charged with protecting America’s forests and litigation-happy special-interest groups. The horror that occurred in California and the other thousands of fires can be traced back to a bird, the spotted owl. In 2018, between January 1 and September 7, there were 46,765 wildfires in the United States, according to the National Interagency Fire Center. The agency also reports over the past 10 years, the financial loss is $5.1 billion. Overall, 2018 is the most destructive wildfire season on record for California; all we can do is mourn the dead, hope for a happy ending for some of the missing, and reach into our pockets to support those who have lost everything. The following is not a news release as it is a fact-filled report for your information. We would appreciate crediting RANGE magazine if you find portions useful in your reporting. RANGE magazine has been following the wildfire devastation for more than 25 years and its insight on the causes and hope for the future have been recognized by fellow journalists. RANGE also received a First Place award in 2013 for its wildfire coverage. In 2018, the judges commented: “Good overview of the ecology of the region. Nice mix of perspectives.” The competition was judged by the Wyoming Press Association. The awards also included RANGE’s sixth consecutive Freedom of the Press Award. In 2013, judges wrote, “This is powerful advocacy journalism, often told in first person by people who are living the issues of the West. It is decidedly one-sided, and suffers at times from not challenging the writers’ own conclusions, but the overall impact is strong.” The 2013 competition was judged by the Arizona Press Association. BACKGROUND: Fires will continue to ignite too-thick drought- and disease-plagued brush and trees, setting off thousands of blazes that routinely put people in peril, destroy their homes and livelihoods, kill livestock and wildlife, and place America’s food source in jeopardy. THINK ABOUT THIS: On a serious note, humorist Lee Pitts reflected in 2016, what will be in jeopardy by wildfires. In “Thank a Farm Animal,” Pitts enumerated the hundreds of products found in drugstores that have ingredients from cattle, sheep and hogs. Out of a 1,000-pound steer, only 568 pounds is consumable meat. In fact, if anemic blood ever failed to clot, the doctors would probably save your life with a drug called thrombin. It came from a farm animal. Let’s do a little fact checking. Other than clothes and shoes, Pitts cites some of the animal-based products we take for granted. Makeup is made from animal byproducts. Plastic surgery would be impossible without cartilage from cattle and animal sutures. Adrenaline from livestock gets those hearts restarted. Biodegradable soap. Leather ball gloves and pigskin footballs. Violin strings and artists’ brushes. Just to name a few. States predicted in the eye of the firestorm included Arizona, California, Colorado, Idaho, Kansas, Montana, Nevada, New Mexico, Oregon, Texas, Utah and Washington. The number of wildfires and acres burned annually depends not only on wildland-fire potential, but also on the number and timing of lightning strikes and human-caused ignitions. 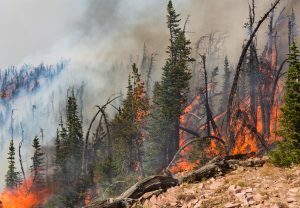 The destructive potential for fires can be directly linked to the failed policies of the federal agencies charged with protecting America’s forests and with litigation-happy special-interest groups, according to RANGE, a publication devoted to issues that affect ranchers, wildlife and food production. RANGE is the outspoken advocate for people who work on the land and is a critic of human-caused problems that plague the West. For decades, RANGE has featured a collection of environmental analyses and special reports on such topics as the link between the health of American forests, destructive wildfires, drought, governmental policy, endangered species, crippling of the logging industry, dire economic consequences, a disappearing rural culture, and legal actions by environmental groups. Playing a starring role in the situation is the impact of federal control of more than 30 percent of America’s lands, making bureaucrats in Washington, D.C., the country’s largest landholders. Westerners are particularly vulnerable because 50 percent of their landmass is federally controlled. In Nevada alone, 84.9 percent of the state’s 110,000 square miles is under federal jurisdiction. RANGE’s numerous special reports about the power of environmental groups, such as Sierra Club, the Wilderness Society, and the Center for Biological Diversity, that have the money and political muscle to design the message and file lawsuits that lay the groundwork for federal decisions that not only close off public lands to food production and recreation but can have tragic consequences. For example, a successful campaign by environmental groups to have the spotted owl declared a threatened species literally destroyed the timber industry in the 1990s and, as a direct result, wildfires destroy millions of acres because forests are a tinderbox of diseased trees and biomass just waiting for Mother Nature or human carelessness to strike. The tragic loss of life, land, homes, and wildlife could be lessened by selective harvesting and clearcutting. Clearcutting removes trees and biomass in locations wherever U.S. Forest Service (USFS) or private landowners choose. (It is routinely used in the West Coast Douglas fir region because Douglas fir is shade intolerant and cannot successfully regenerate itself in its own shadow.) The cut area looks rough for a while but offers great relief to the forest. Clearing away trees will also stop tree-killing crown fires. The flames have to go around and start over again on the other side. Again and again. The clearcuts buy time and space. Clearcutting is more scientific and effective than the “raking,” suggested by President Trump. Selective thinning means many of the trees in a block of thick forest are cut, eliminating competition and leaving trees with space around them to get more water. Trees with space have more vigor that can fight disease and insect infestation. Thinning also means more sun gets to the forest floor, which can then grow grass and forbs for deer and other wildlife. There is a bit of good news: There are some who are starting to realize selective thinning and clearcutting of the forest are positive approaches in combating wildfires. The bad news: There are few loggers, sawmills or equipment in former logging towns—basically, timber as a vigorous industry no longer exists. Unfortunately, fire season is upon us, and those in the path of the firestorm still await policy changes from the U.S. Forest Service regarding public lands. To access a few of RANGE magazine’s more than two-decade archives addressing wildfires, visit www.rangemagazine.com, and click on the BACK ISSUES icon at the top of the home page. Following each release, which provides the issue and title of specific stories, there are a number of corresponding photos/graphics available for your use. If any of the special reports or coverage of wildfires by RANGE is useful in your reporting, we ask that you give RANGE editorial and photographic/graphic credit. To request interviews or if you have a need for high-res photos, please email needs (DPI and Width) to editor C.J. Hadley at edit@rangemagazine.com. A comprehensive report covering all the aspects of the destruction of American forests, from the spotted owl, the special-interest groups, the people, and the failed policies. A timeless read. Following is a story that appeared in the Winter 2013 issue of RANGE. Despite the intervening years, the story about living through the desperation and fear during a wildfire is remarkably current; only the location changes. Jim Petersen is the Idaho-based founder and president of the nonprofit Evergreen Foundation. Petersen uses bar graphs assembled from U.S. Forest Service data that quantify annual gross growth, mortality, net growth and removals in national forests in Idaho, Montana and Washington east of the Cascade Range. Petersen’s solution to an unworkable situation? Despite recent testimony to Congress, the ecologist says we need to question whether the Forest Service really has sufficient staffing to move faster than it does. “We also need to separate firefighting from forest restoration work. Sending thousands of Forest Service employees off to fight fires every summer is ridiculous. Nothing gets done, but even worse, the cost of fighting wildfires—more than $2 billion last year—has been deducted from the Forest Service’s forest restoration budget,” he writes. Writer Jim Steele is an ecologist who was a principal investigator for the U.S. Forest Service. Steele’s science-based analysis refutes claims that wildfires are “part of a dire global warming-fueled trend toward larger, more frequent and intense wildfires.” He contends proponents are ignoring a well-documented history of natural climate change, ignoring the ill-advised 20th Century policy of fire suppression, and ignoring the increased percentage of fires set by humans. “Firefighting on federal land has become a big business with little incentive to put fires out early but, as with everything else, if it doesn’t make common sense, then follow the money,” writes Boyle. She cites a series of operational failures by the Bureau of Land Management and U.S. Forest Service—misjudgment that led to horrific destruction. Andrea Scott looks at the aftermath of wildfires, and Steven H. Rich, reports on the lessons not learned from the nation’s first mega-fire in Arizona that killed six firefighters, burned 24,000 acres and destroyed 63 homes in June 1990. Bruce Vincent is a third-generation logger, and is owner of the consulting firm Environomics, executive director of Provider Pals, and member of the board of the Evergreen Foundation. “In 2000, the General Accounting Office presciently reported that the single biggest threat to 192 million acres of western forests is catastrophically huge, catastrophically hot, stand-destroying forest fires. Fed by pervasive fuel-loading problems in our dead and dying overstocked forests, the casualties of the coming calamity will include our wildlands, watersheds, wildlife and forest communities. The report states that the agencies [federal] have done precious little to combat the potential collapse of forest ecosystems,” writes Vincent. Derek Weidensee has worked as a licensed land surveyor for decades in Rapid City, S.D. Before that he spent 10 years as a logger, five of those salvage logging beetle-killed timber in the Targhee National Forest in Idaho. Weidensee’s analysis explains how clearcutting works and why, when used as a preventative measure, it reduces the severity of wildfires. Derek Weidensee draws on his experience as a logger to explain why the fear of wildfires is behind a growing public desire for more logging of America’s forests. Steven Rich, a range-management expert, explores the naïve acceptance of wildfire’s catastrophic destruction by the public. I lived in Nor-Cal for about 4 years. Worked at a timber company in the late 90’s. And Trump’s intent is accurate really. It would need to be a very large rake but California is the most idiotic forest management I have ever seen. The bio-mass mentioned or fuel-base as we called it, was unbelievable. We would go hiking an camping in the forest and there was fuel-base or dead-fall up to my knees back then. And then you would come across these Forest Signs that warned that no firewood collection was allowed. And the forest management would not or could not sell it to private contractors for value of the dead-fall. Do that math. The timber company I worked for cleaned up all their properties dead-fall and debris every Autumn. Its just good stewardship of the land using no more good common sense then God gave a cow. Environmentalism, a conspiracy ? Maybe. Or just boneheaded idealism? probably. Either way, end result is same.